Kaiser Fototechnik has just introduced ProDisk, a universal tool for managing white balance, exposure and colour. The ProDisk combines a grey card, a white balance filter and a colour checker in a slim folding plastic housing. The grey card and the colour checker are normally placed within the scene and are helpful tools for exposure metering or a follow-up colour comparison. When doing a manual white balance the translucent white balance filter with its special surface pattern needs to be held in front of the lens. The Pro Disk is available in two sizes, ProDisk mini and ProDisk II. The MSRP is €59.99 for the ProDisk mini and €69.99 for the ProDisk II. Kaiser Fototechnik has just introduced ProDisk, a universal tool for managing white balance, exposure and colour check. Automatic controls of today’s digital SLRs are normally doing their job for the most part, but occasionally may fall short interpreting the scene in front of the lens, leading to suboptimal white balance or exposure. Sometimes there is also a need to exactly replicate a certain colour. While all this can be optimized on a PC with a calibrated screen, it is better to do it right with the shooting. 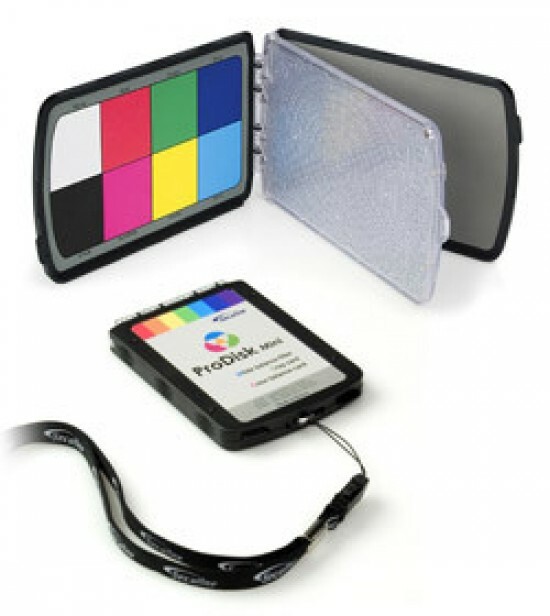 ProDisk combines a grey card, a white balance filter and a colour checker in a slim folding plastic housing. Grey card and colour checker are sheltered in the upper resp. lower covers, that fold backwards up to 180° to open for the white balance filter. ProDisk White Balance FilterThe grey card and the colour checker are normally placed within the scene and are helpful tools for exposure metering or a follow-up colour comparison. When doing a manual white balance the translucent white balance filter with its special surface pattern needs to be held in front of the lens. Filter and cards are safely secured when folded down and ProDisk will neatly fit into your pocket or can be carried around your neck using the strap supplied with the unit. ProDisk is available in two versions: ProDisk II is 145 x 101 x 11 mm (5.7” x 4.0” x 0.5”) in size and weighs 135 g, its white balance filter can be used with lenses up to 9 cm (3.5”) in diameter. The respective specifications for ProDisk mini are 103 x 73 x 10 mm (4.1” x 2.9” x 0.4”), 75 g and 6 cm (2.4”) lens diameter.